A popular park in a Northumberland village has undergone a new facelift thanks to community regeneration specialist Frank Haslam Milan (FHM) North East. The memorial park benches at Ponteland Park in Castle Morpeth have been stripped, stained and restored to bring them back to life for local residents to sit and enjoy the beautiful surroundings. 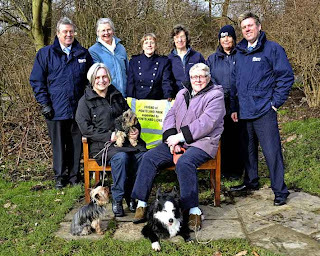 The Wearside-based firm approached Friends of Ponteland Park (FOPP), a group of people who tirelessly strive to improve the quality of the 18-acres of park for wildlife and as an amenity for the whole village. By way of a donation, the group which consists of 250 members, requested for all thirteen memorial benches to be restored and FHM were only too happy to oblige. Simon Ferry, FHM’s Lead Resident Liaison Officer said: “We have just completed internal refurbishments on a number of bungalows and a sheltered housing scheme in Ponteland and we wanted to give a donation to one of the community groups in the area. “We were introduced to FOPP at last year’s Pride of Northumberland Awards who said they would love to restore the benches within Ponteland Park but couldn’t afford to do so. FHM and a team from sub-contractors Colin Marshall Decorators worked with local residents to find out what colour stain they wanted the benches at the park which is owned by the Tyne Council of Ponteland. Alma Prickett of Darras Road in Ponteland is Treasurer for FOPP and has been a member since its inception in November 2005. She said: “We are delighted that FHM volunteered to restore the park benches. “Over the course of the last three summers, we have tried to maintain the look of the seats to a good standard but they have deteriorated and weathered and we were anxious as people have donated these to the park. Photo caption: Back row left to right: Clive Metcalfe (FHM Operations Manager), Alma Prickett, Heather Forshaw, Margaret Stainsby, Sharon Bulmer (FHM Resident Liaison Officer) and Simon Ferry (FHM Lead Resident Liaison Officer). Front row left to right: Sue Duncan, with Ellie and Rosie and Coral Wilmot, with Jess.